CBDT issued a circular no. 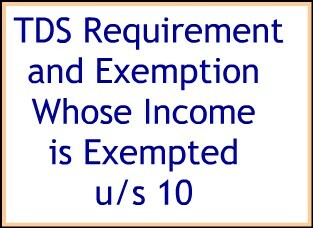 18 dated 29 May 2017 about Requirement of tax deduction at source in case of entities whose income is exempted under Section 10 of the Income-tax Act, 1961 - Exemption thereof. Full circular is as under. The Central Board of Direct Taxes (the Board) had earlier issued Circular No. 4/2002 dated 16.07.2002 and Circular No. 7/2015 dated 23 .04.2015 which laid down that in case of such entities, whose income is unconditionally exempt under Section 10 of the Income-tax Act (the Act) and who are also statutorily not required to file return of income as per Section 139 of the Act, there would be no requirement for tax deduction at source (TDS) from the payments made to them since their income is anyway exempted from tax under the Act. The issue of whether exemption from TDS can be extended to more entities on these principles and whether the exemption is needed to be withdrawn in respect of some of the exempted entities was examined by the Board. • Entities that meet both the above mentioned conditions but are not mentioned in the aforesaid Circulars need to be included in the list of exempted entities. • Entities that are mentioned in Circular No. 4/2002 but their exemption from income tax has since been withdrawn need to be removed from the list of exempted entities. • Entities that are mentioned in Circular No. 4/2002 but because of subsequent amendment they are now required to mandatorily file their returns of income U/S 139 need to be removed from the list of exempted entities. 4. This circular supersedes earlier Circulars on this issue e.g. Circular No. 4/2002 dated 16.07.2002 and Circular No. 712015 dated 23.04.2015 with effect from the date of issue of this Circular.